n 1862, Morris, Marshall, Faulkner & Co. began to advertise 'Painted Earthenware including wall Tiles with pictured subjects, figures or patterns'. Blank tiles imported from Holland were hand-painted, often by the wives and sisters of the partners, before being refired at the company’s first premises at 8 Red Lion Square, London. "The great advantage and charm of the Morrisian method is that it lends itself to either simplicity or splendour." 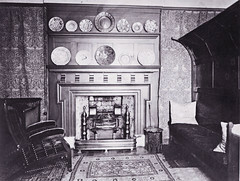 Sought-after for artistic wall and fireplace decoration, Morris tiles were painted in-house until 1873, when employee William De Morgan established his own ceramics design and manufacture business. Continuing to collaborate closely with Morris, De Morgan became a major supplier to Morris & Co. (as it was known from 1875), and his wares became part of an integrated Morris 'look'. De Morgan became well-known for his Persian-inspired tiles and vessels, many of which made use of his rediscovered early Islamic lustre glazing techniques.